The story opens with Batgirl recounting a fight with Talia, as told to Barbara Gordon’s diary. After Talia kicks Batgirl into a closet, the story shifts back a few minutes to start from the beginning. Barbara is working in her college chemistry lab with Mr. Siddiq. A mishap sends her to her locker for a change of clothes. After talking with the guards a moment, she heads down the hall. Moments later, Talia al Ghul enters, and quickly subdues the guards. When Barbara returns, she knows something is wrong when she sees the unconscious guards, and quickly changes into her Batgirl costume. Meanwhile, Talia has found Mr. Saddiq, or Dr. Fazil, as she calls him. Seems Fazil is on the lam from Ra’s al Ghul, and Talia is here to collect. She shoots him with a dart, meant to make him more compliant. Just then, Batgirl swings in. 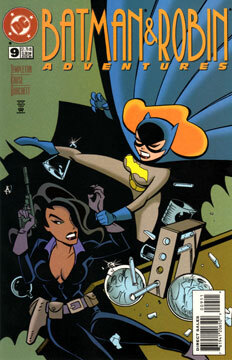 She and Talia go a few rounds, with Batgirl ending up beaten and thrown in a closet. Talia makes to escape with Fazil. But Batgirl knows her chemistry, and grabs the ingredients to make a crude tear gas. In the stairwell, she unleashes the gas on Talia and Fazil. Talia goes down, and Batgirl delivers Fazil to the arriving police. In that time, Talia gets away. An effective, if simple, story. It’s always nice to see Batgirl out on her own, and Talia is always a delight. In the animated universe, this is the first known encounter between Batgirl and Talia. That’s got to count for something, right? Kruse and Burchett’s continue to deliver in these post-Parobeck days. Some good energy in these panels. Anything of interest to customizers or cosplayers? Is this issue worth my precious time? Yes, if you’re a Batgirl or Talia al Ghul fan. Two-Face escapes Arkham to… save Grace? It’s the animated Amalgam universe! To Live and Die in Gotham City! Harley and Ivy and… Robin? This web site a joint project between Inanimate Objects and The Action Figure Hub. All contents are © 2012-2019 - DCAU Comics - All rights reserved. BATMAN™, Superman™, Justice League™ and all related characters are trademarks of and © DC Comics and Warner Brothers Entertainment Inc. This is a fan site and is not affiliated in any way with DC Comics or Warner Bros. No copyright infringement is intended.